Maybe you have an art show where you intend on displaying dozens of photos or paintings. Perhaps you have a corporate event or office renovation where you need an array of posters and prints. Or maybe you just have a lot of photos from a recent event— wedding, first baby photos, etc.— and you want to frame them all in your home. 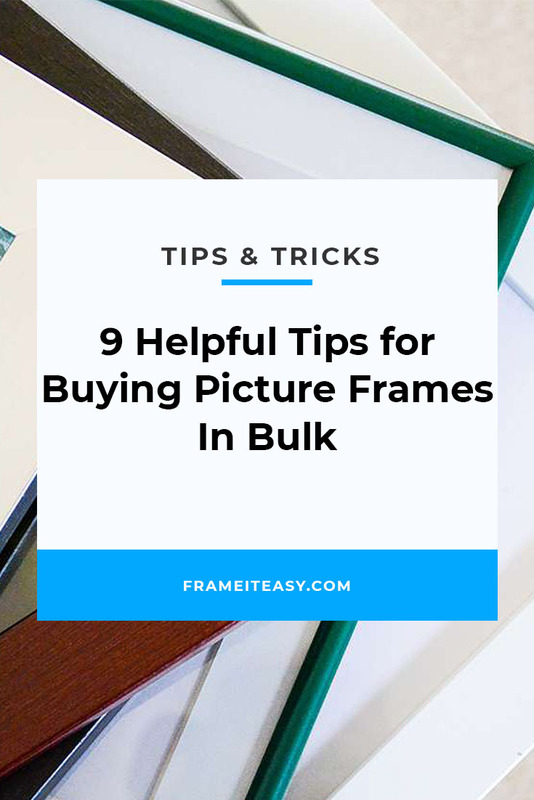 Either way, this would require you to order a large number of frames at once— or, in other words, ordering picture frames in bulk. And while this may seem a straightforward process, there are some things you might want to consider before beginning with your project. The long and short of it is that the more frames you need, the more money you have to spend, so it’s important to reduce the chance of error and keep the cost to as low as possible. This seems obvious, but with small orders, a mismeasured piece of art is a minor inconvenience that could be rectified easily. With larger orders, it could turn into a missed deadline, a large amount of wasted money, and other such things we’d all rather avoid. This could be magnified if the nature of your bulk order was 50 of the same frame. So, it would be beneficial to measure your artwork a few times just to make sure your numbers are accurate. It would beat the alternative of missing a deadline and/or having to place a replacement order. As stated previously, more frames means more money. It doesn’t have to the maximum amount of money possible, though. Most online custom framers offer discounts of varying percentages. If you don’t already have a valid coupon for the site from which you intend to order, it might be worth your while to reach out to the company and see if you could have one. Even if the discount is small, it’s still money saved! 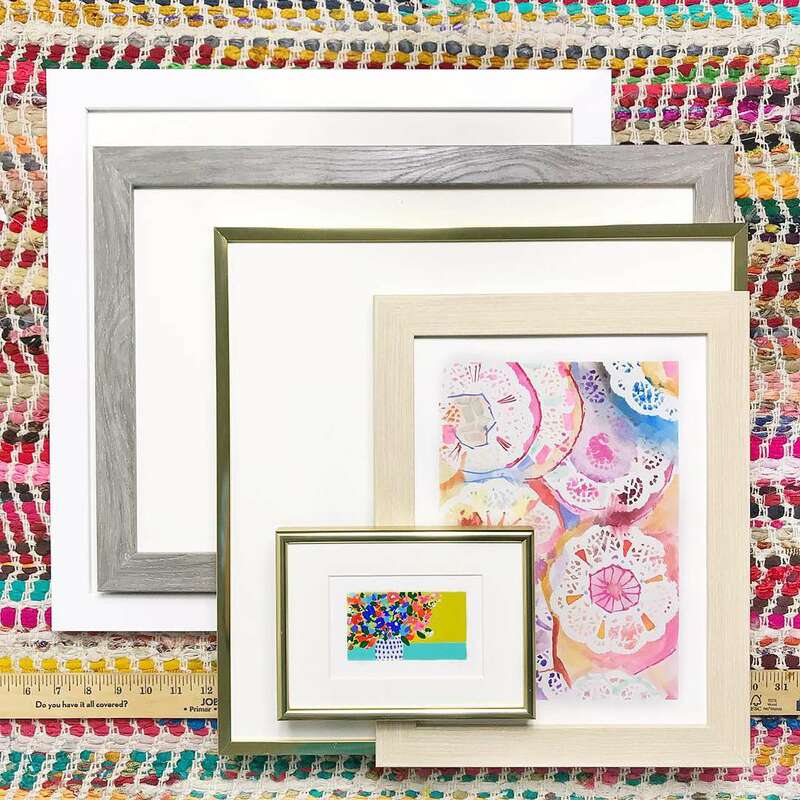 Psst…check out the bottom of this post to save 10% on an order from Frame It Easy! Custom framers have made their niche in making frames for even the weirdest sized piece of art. But this wasn’t always the case. Store bought frames in particular are typically standard sized, meaning they’re cut to frame conventionally measured photographs and pieces of paper. If you have a bunch of posters that you intend on framing for a corporate event and aesthetic isn’t necessarily of the most pressing importance, simply buying store bought frames could be your best bet. 4. Are You Ordering a Bunch of the Same Sized Frames? Or One of Several Different Sized Frames? Ordering picture frames in bulk could mean a few things. You could be ordering 50 of one frame or 50 different frames. Either way, this is an important distinction as it would have implications on the scale of your measuring job and how you plan to order. You can consider fragmenting your order into multiple ones if it might make the measuring itself easier and the cost more manageable, but more often than not bundling frames together can overall be more efficient. Here at Frame It Easy, it doesn’t much matter if you order the same size frames or different sized ones — since our boxes are also custom to each order, you can rest assured you’re getting the most efficient price, shipping, and packaging whether you order 1 frame or 100 frames. A big order is also a big financial commitment. As such, it’s important to make sure the framer you’re buying from is reputable and if they’ll make right any damaged material you receive should there be an unforeseeable mishap. Still, making a large payment to a company you know a thing or two about is better than going in blind. A great way to check for this is to see if a company has any customer reviews publicly available. These can typically be found either on the company website directly, an on-site review badge, or searching through a third-party review website. If you have time, we’d also suggest ordering a single sample frame first, just so you can get a feel for the product and process. This is a good way to see exactly what the product is like before making a larger financial commitment. 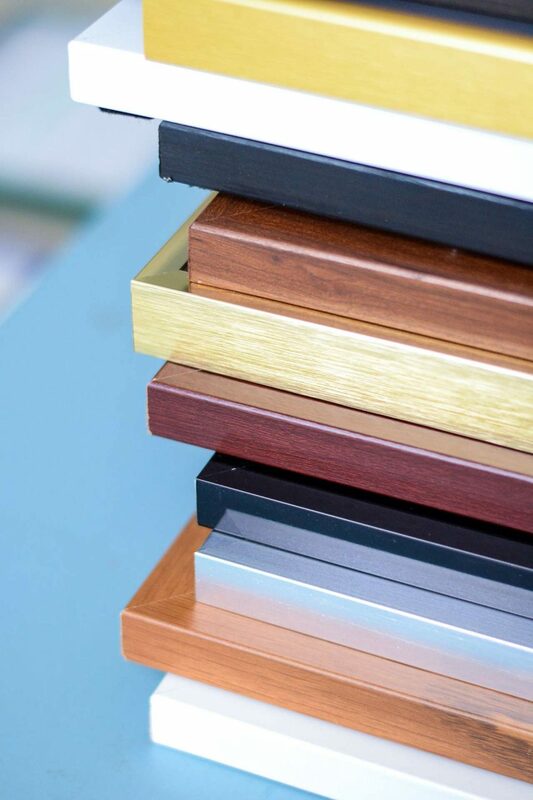 Here at Frame It Easy, you can order a single frame to get a sense of the overall package, or we sell individual components of frames that you can order as samples. 6. Consider Deadlines. Do You Have Any? And How Soon? Some companies may have a longer production time for bigger orders. You might want to make sure you order well before the date of your presentation, gallery opening, or event. In addition, it might be beneficial to see how close the company from which you’re ordering is to your location. Transit time would also influence your wait time. 7. What Type of Frame Are You Purchasing? 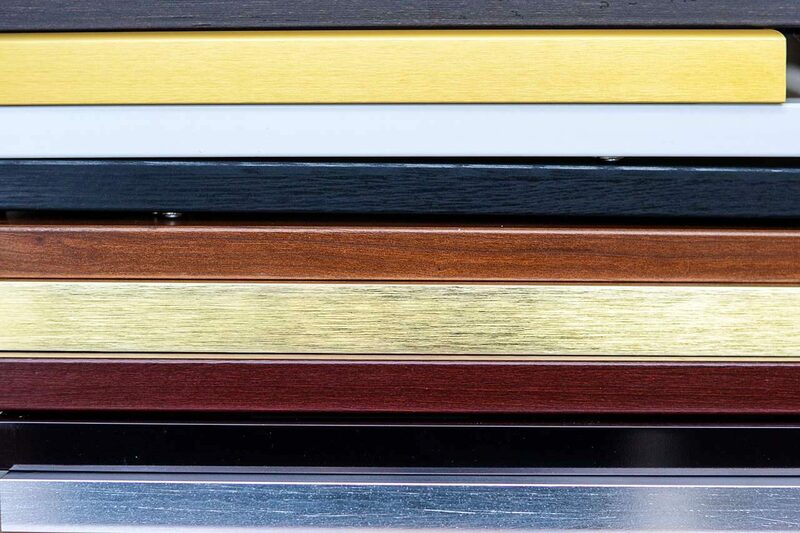 You might know the material that you’re planning on getting for your frames. Most companies offer only two — wood or metal frames. For each material, there may be a large selection of colors and textures for that particular option. That said, if a company offers different styles of the same material, it could mean a different cut or molding. While this is mainly an aesthetic thing, it could also affect cost so it’s important to make sure you know exactly what picture frame features you’re getting so the display is perfect for your needs. Imagine getting all your frames, you insert your posters or art, and you’re ready to display them. But once you do, it’s right across the way from a window opening, and the sun reflects off your frames — making it impossible for people passing by to see what you’re showing. To prevent such a thing, it would be beneficial to see where your frames will be placed, as well as exploring all cover options you have with the framer from which you’re purchasing. If you plan on hanging your frames where it could be hit with glare, then you might opt for non-glare covers. Orientation is something easy to overlook, but could be an inconvenient issue. If your posters are portrait orientation, but you order the frames as landscape, your display will look… sideways. So, it’s important to just take a few extra seconds and make sure the orientation (as well as the measurements as noted in Tip #1) are correct. For more information on orientation, you can view our art measuring guide. We’ve gone over a few potential nightmare scenarios that could occur while ordering picture frames in bulk, but most can be prevented with just a bit more thoroughness. Unboxing and preparing frames should be easy, but these precautions will make it that much easier. Make sure you have the correct measurements, cover, and orientation. Ask for a coupon, if you can. And always check in with the company you’re ordering from, to ensure they’re a good fit for you.